For Pittsburgh, A Difficult Year Reveals Long-Buried Problems A string of shootings and revelations about clergy abuse has made 2018 a hard year for the people of Pittsburgh. But some are finding new activism and hope within tragedy. 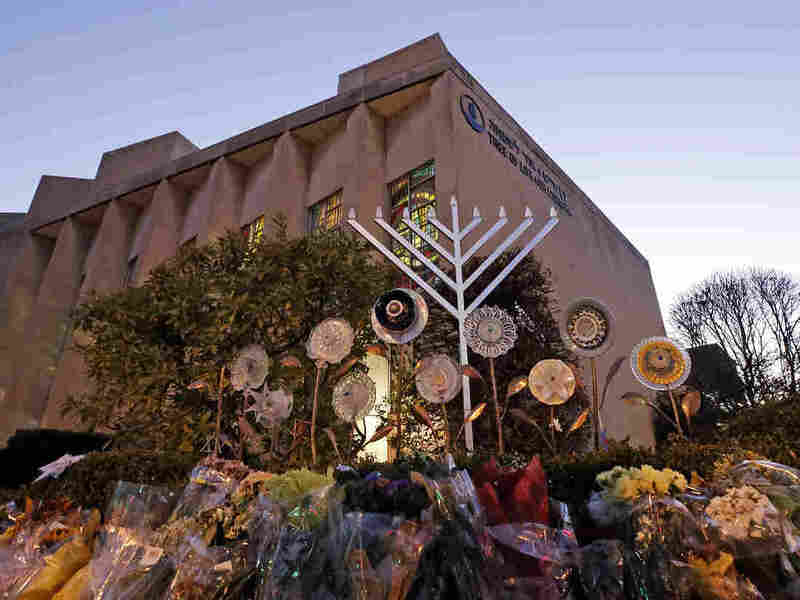 A menorah is installed outside the Tree of Life Synagogue in Pittsburgh on the first night of Hanukkah.The synagogue was the site of a mass shooting in October. It was one of a number of tragedies and revelations that made 2018 a difficult year for the city of Pittsburgh. 2018 has been a hard year for the community of Pittsburgh. This was the year that institutional racism, child sexual abuse, and anti-Semitism burst to the surface in the city. But for Pittsburgh native Cheryl Moore, the bad year actually began with baseball. In January the Pirates traded away star outfielder Andrew McCutchen — known for his thousand-watt smile and deep love of Pittsburgh. "The crazy thing is he loved us as much as we loved him," said Moore. "So that was a painful start to the year. Obviously a less intense thing than many things that happened as time went on." In June an officer shot 17-year-old Antwon Rose in the back as he ran away. His death ignited protests in and around the city for weeks. Christian Carter was among those who organized and marched. The 19-year-old had just graduated from high school and Rose's killing felt personal. "Antwon looked just like me. And he looked like my brother and he looked just like my cousin," explained Carter. "So it was so close to home, it was so important and for us to show up and say that this can't happen again and that we can't allow this to keep happening." For Carter, the shooting exposed racial fault lines that he's always known existed in Pittsburgh. Another long-standing trauma was made public this summer when the state's attorney general revealed the findings of a grand jury report that documented the sexual abuse of children by clergy and other church officials. Nearly a third of the accused priests were part of the Catholic Diocese of Pittsburgh. And in October, a man who espoused hatred for Jews entered the Tree of Life Synagogue and shot and killed eleven congregants. But the problems that surfaced in Pittsburgh in 2018 aren't new, says Dan Gilman, chief-of-staff to Bill Peduto, Pittsburgh's mayor. Gilman is a former city councilor who represented the neighborhood where the synagogue is located. "These are multi-generational, systemic issues in our society but for too long we pushed them into the basement, covered them up and pretended they weren't there," he explains. And now, as a result, Pittsburgh sees itself differently, says Leanna Fuller, associate professor of Pastoral Care at the Pittsburgh Theological Seminary. "We all sort of have this unspoken belief that our communities are immune from these sorts of things happening. That's just not true. Pittsburgh has just bumped up against that reality in a really stark way," said Ford. Reconciling that reality has been hard, but it hasn't been without hope. I know that I'm fighting for a world that my great, great, grandchildren can hopefully live in. So I think Antwon taught me that I have to use my voice. Christian Carter says the death of Antwon Rose set him on a new course. "Activism is my life. It is my tool for survival. And I know that I'm fighting for a world that my great, great, grandchildren can hopefully live in," said Carter. "So I think Antwon taught me that I have to use my voice." Gilman says listening to protesters and those who've been marginalized is the how the city begins to fix itself. "This is a Pittsburgh for all, and if it's not for all, it's not for us. And I feel like Pittsburgh is a community that is resilient and committed to doing that," said Gilman. "So, I don't know that good came out of tragedy, but I certainly have found ways to find hope in tragedy." So, I don't know that good came out of tragedy, but I certainly have found ways to find hope in tragedy. At the Theological Seminary, Fuller sees an opportunity to build relationships with people who are different from them, to prevent destructive ideologies from taking hold. "It's a lot harder to perpetrate an act of violence on a group if you actually know people in that group or you are friends with people who meet that description," she says. The night after the Tree of Life Shooting in the Squirrel Hill neighborhood, the streets filled with people singing, holding candles, and grieving. One high school sophomore spoke to the crowd, and said what many knew to be true: Pittsburgh would never be the same.